I think it’s safe to say that this has proven a rewarding experience for myself and those involved and am happy to be able to report back on some progress and learnings! For one, the time spent cultivating a culture of knowledge-exchange that was rewarding for participants and our engaged audience, has paid off. That our network continues to grow, with new helpers and campaigners signed up to get our guides joining every week, tells us that we’re headed in the right direction. 17 volunteer helpers based in Australia, Canada, Netherlands, Peru, U.K. and U.S.
To get a more detailed account of the ‘making-of’ and our network-building practices, check out this account we recently put out on Mobilisation Lab. And by the way, Blueprints is powered by campaigners like you and we could use a lot more help! If you have a little bit of time to spare, write us at blueprintsfc@gmail.com to join the Slack team and get started. Guides galore and more guides to come! 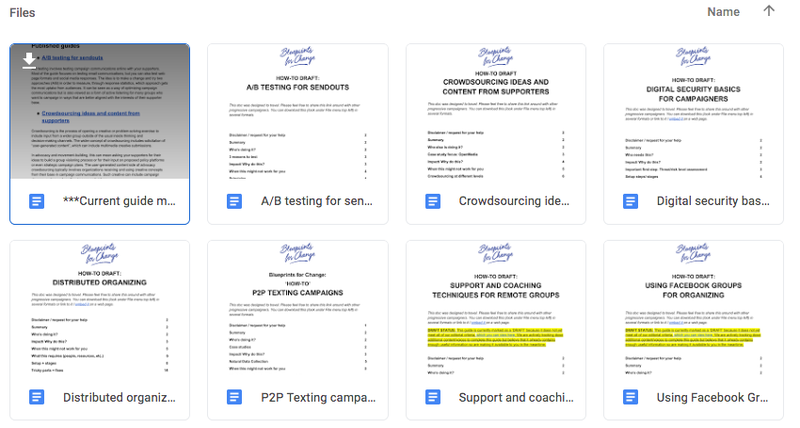 So far, we’ve managed to get together well over a hundred pages’ worth of how-to guides for progressive campaigners (8 published guides), with information drawn from the collective experiences and collaborative voices of campaign thinkers and doers from around the world. And we’re not even close to being done. There are currently 8 new guides in the making, which you can view on our crowdsourced topic list here. For those just skimming, I’m pasting links and descriptions of existing guides below to give you an idea of what we’ve been able to cover. Hope these guides help progressive groups fight back against all the nastiness coming up in the world these days! When stuff gets crazy, we’ve got to put our heads down and organize. Sharing best practices with each other is one way to do this, IMHO. A/B testing involves testing campaign communications online with your supporters. Most of the guide focuses on testing email communications, but you can also test web page formats and social media responses. The idea is to make a change and try two approaches (A/B) in order to measure, through response statistics, which approach gets the most uptake from audiences. It can be seen as a way of optimizing campaign communications but is also viewed as a form of active listening for many groups who want to campaign in ways that are better aligned with the interests of their supporter base. 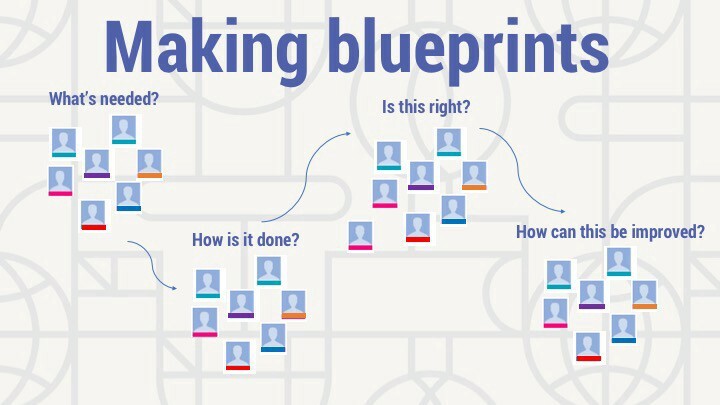 Crowdsourcing is the process of opening a creative or problem-solving exercise to include input from a wider group outside of the usual inside thinking and decision-making channels. The wider concept of crowdsourcing includes solicitation of “user-generated content”, which can include multimedia creative submissions. In advocacy and movement-building, this can mean asking your supporters for their ideas to build a group visioning process or for their input on proposed policy platforms or even strategic campaign plans. The user-generated content side of advocacy crowdsourcing typically involves organizations receiving and using creative concepts from their base in campaign communications. Such creative can include campaign slogans, custom re-branding, images and videos. Digital security practices help protect campaigners from malicious online attacks and intrusive surveillance efforts led either by groups that are hostile to your agenda or by repressive government agencies. Distributed organizing (as opposed to community organizing or traditional political organizing) activates a network of self-starting supporters/campaigners in multiple locations, which can spread across geographical boundaries, interests and cultural groups. It draws on the initiative and energy of volunteer organizers to start groups and lead teams with varying degrees of autonomy. Though more horizontal when compared to traditional “command and control” leadership, distributed organizing often relies on a central coordination group to launch the network and to drive it towards common goals and milestones. When done properly, it can help a movement or campaign scale rapidly and channel huge amounts of collective power. Peer to peer texting is a method for contacting your base via text messages to deliver calls to action. Usually done at high volumes, it requires a P2P texting platform and a group of staff or volunteers to deploy the campaign. (True person to person texting, ie. texting one’s own contacts using your personal device as part of a campaign, would fall under the heading “phone/text banking” and will be treated in a separate how-to). As digital group-work tools make it easier to coordinate teams at a distance, campaigns that access them can now scale rapidly and build collective impact through distributed organizing (see our guide on this for more). One of the challenges of this kind of organizing is that the lack of face time and direct human contact can lead to engagement and morale drop off. Several groups that have sparked remote teams and chapters have now developed ways to support these groups at a distance and maintain a sense of purpose and togetherness with their supporters no matter where they are. While Facebook has come under a lot of criticism lately for its leaking of user data and its complicity in right-wing voter persuasion, dissemination of fake news… and the list goes on… it remains a social network that large segments of the population use daily and therefore cannot be dismissed as an organizing tool. For groups needing to reach out and build their base and mobilize people to come out to events, Facebook remains an important part of an organizer’s toolkit. Given that the conventional ways that organizations have used Facebook to reach out (through a Facebook Page), are generating diminishing reach (since Facebook changed its algorithm), it’s important to explore how groups are making tactical use of the network through the platform’s Groups option. Volunteer-led phone banking uses campaign volunteers to reach out to voters and supporters through phone calls and is now most often supported by software that helps dispatch calls among volunteers and log progress. Phone banking is effective for supporter identification, voter persuasion, event invites, fundraising, volunteer recruitment, and Get Out The Vote (GOTV) efforts.